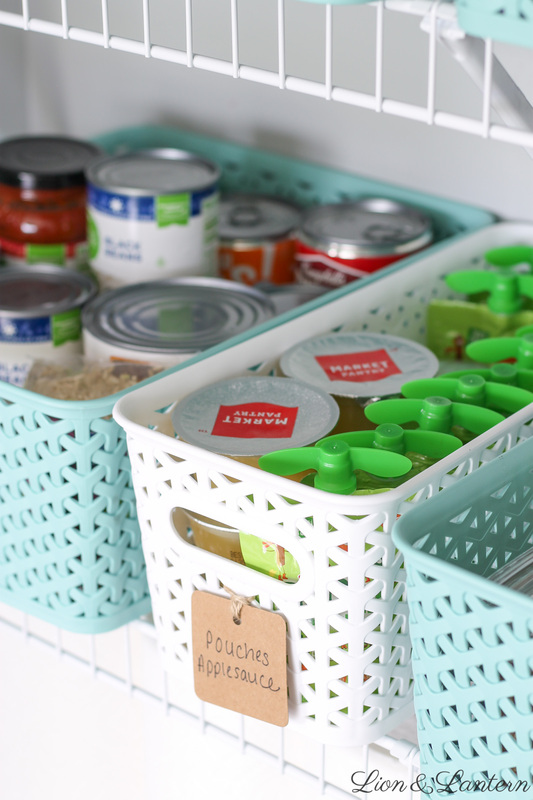 Matching baskets and simple labels keep a small pantry organized and tidy! Yikes! I had done a little organizing with cardboard boxes, but things were getting out of hand. It was difficult to grab snacks easily, and I felt a little embarrassed asking houseguests to dig around for things. 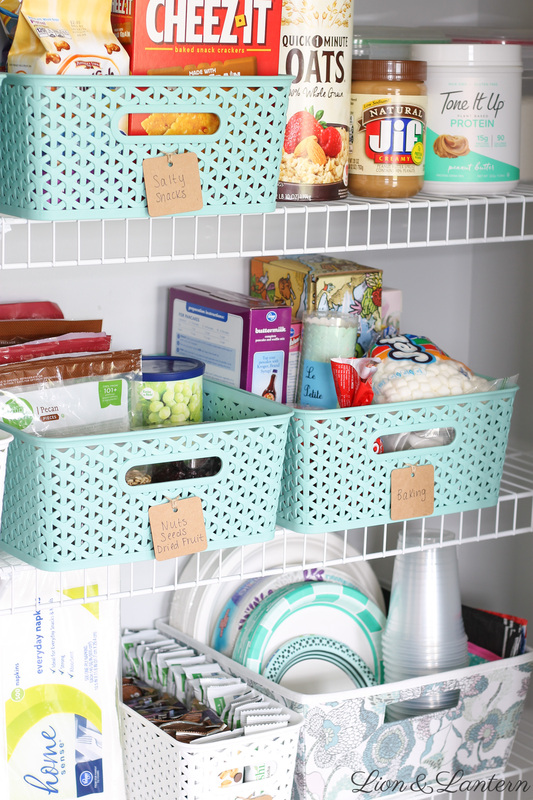 So, I began searching Pinterest and my favorite blogs for budget organizing tips. This post by Abby from Just A Girl and Her Blog inspired me! I especially loved the pretty, sturdy baskets she used, and was excited to find them still in stock at Target. If you are interested, they are called “Y Weave Baskets” and come in several colors. After a little Target trip, I had fun sorting through the food in our pantry, tossing old items, and deciding how to label my baskets. Here is the finished product! I am so pleased with how things turned out! The texture and pop of color from the baskets give a cohesive look. Using gift tags and twine for labels makes it easy to identify what is inside each basket. I chose simple categories that work for our habits; for example we use the nuts/seeds/dried fruit almost every morning for oatmeal, and I can even pull the bin out and bring it to the table. Finally, I chose a pretty fabric bin (also from Target) to corral our disposable plates and cups to make serving easy when we have parties. Yay! Now I get a little thrill every time I open the pantry door. There is something about an organized space that feels so cheery. 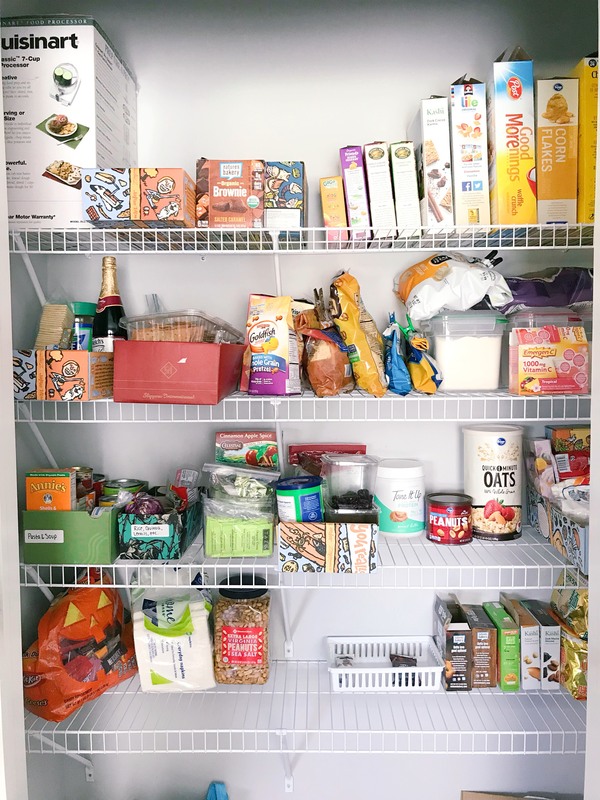 And now everyone–including guests and my hubby 😉 –can easily find the snacks and breakfast foods. Even Bug enjoys choosing his own treat, and this tired, pregnant Mama doesn’t need to get up. Win win! Thank you so much for stopping over today, friends! 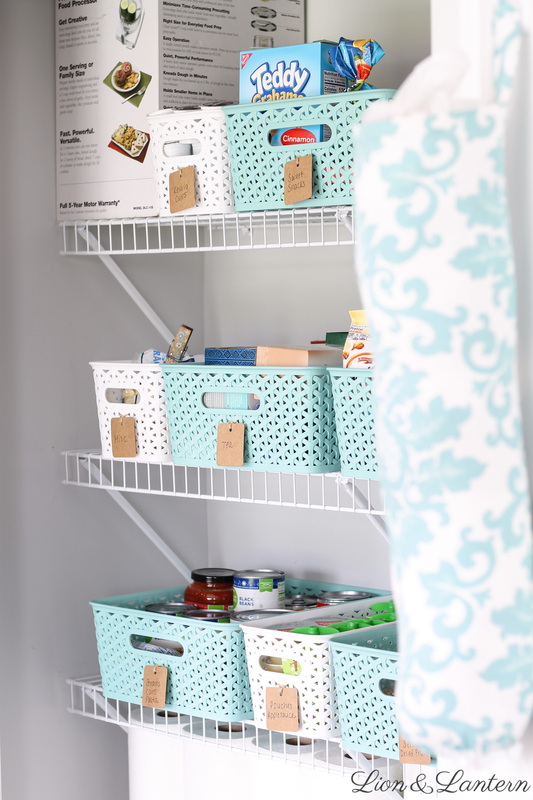 What are your favorite spaces to organize? 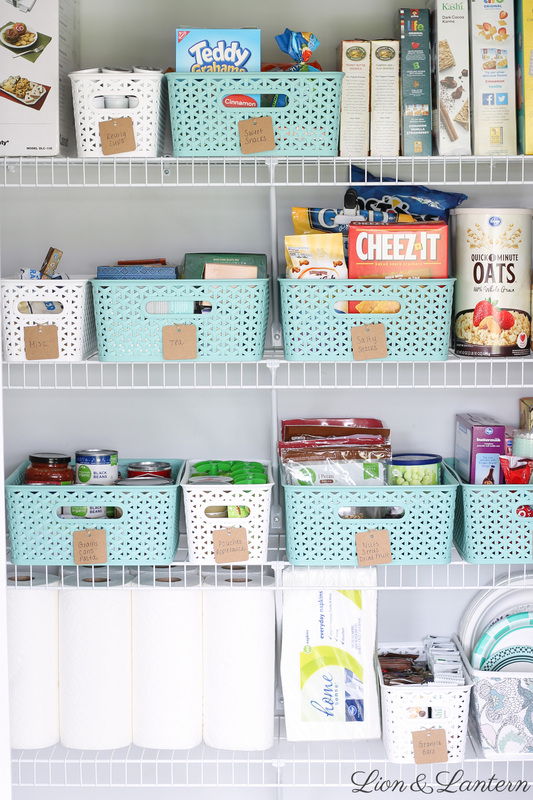 Do you have any tips or suggestions for pantry organization? I would love to see what you are working on, so leave a comment below!